I know that restaurants all over America frequently carry “pasta with butter” on their children’s menu. When I see these words, I always think, seriously? no peas, no carrots, no broccoli, not even a soupçon of garlic? Just butter and pasta? Until of course one day, when my friend Vrushali begins telling me about the ribbons of saffron pasta at Raffaeto’s in New York where you can choose from a variety of different pasta flavors, in any quantity that you want and they will cut it to your desired thickness. Raffetto’s pasta is old-world and toothsome and requires just a few minutes of cooking in a pot of boiling salted water. “So how do you eat it?” I ask, intrigued by the sound of yellow saffron pasta from a store in Soho that I have walked past many times but never entered. “With just a little butter” she says. That statement sets me off on a path to pasta and butter. And indeed, I find that you can begin with a small pat of butter in a hot pan, throw in nothing or some broadly sliced garlic (the finer you mince garlic, the stronger the garlic flavor) or sweet white onions and toss in any pasta + boiled vegetable or even torn fresh spinach along with a little of the (salted) pasta water, finished with some fresh basil and another little pat of butter to arrive at a delicious outcome. How to cook the pasta is something that takes me a little while to get right. I watch a “how not to” Andrew Carmellini video on Chow.com, take a class with Patrick Lacey at Eataly and also find myself making pasta with Peter Berley at ICE. The idea is to salt the water enough such that it “tastes like sea water” in a big enough pot where the pasta can “dance.” Put pasta in after the water comes to boil. Make sure to give things a stir once in a while so the pasta doesn’t stick to the bottom of the pan. Test the pasta by lifting out with a slotted spoon and taking a bite. When done, don’t empty everything into a colander in the sink. Gently lift the pasta out of the boiling water with a slotted spoon and dunk directly into the sizzling butter-garlic-onions-wilted spinach (if using). Add a little of the salted pasta water and give a stir – the butter and pasta water form a sort of velvety butter sauce. 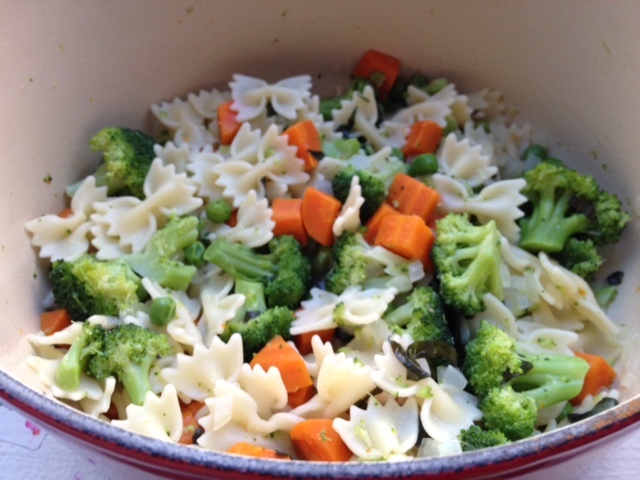 Next, add your steamed or boiled vegetables that cooked alongside (or with) your pasta. Remove from flame, stir in freshly torn or chopped basil leaves (other herbs work well too) and another little golden pat of butter. The pasta is ready to eat. 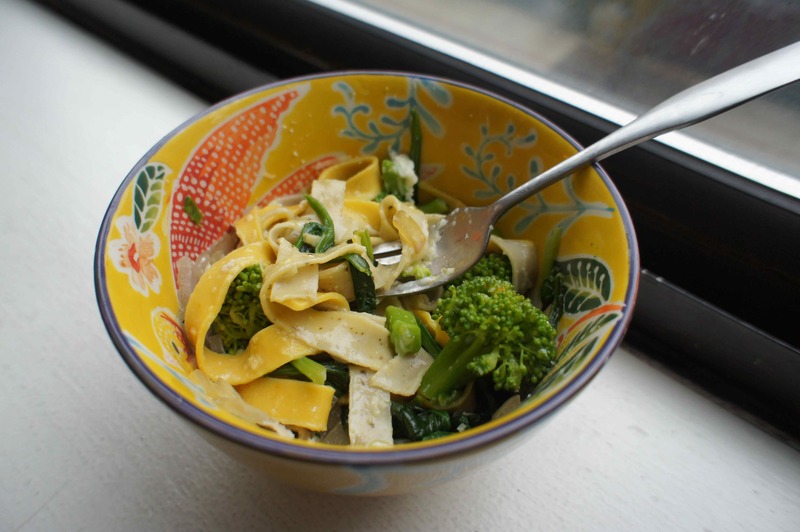 Note: you can use plain or filled pastas, like ravioli here. 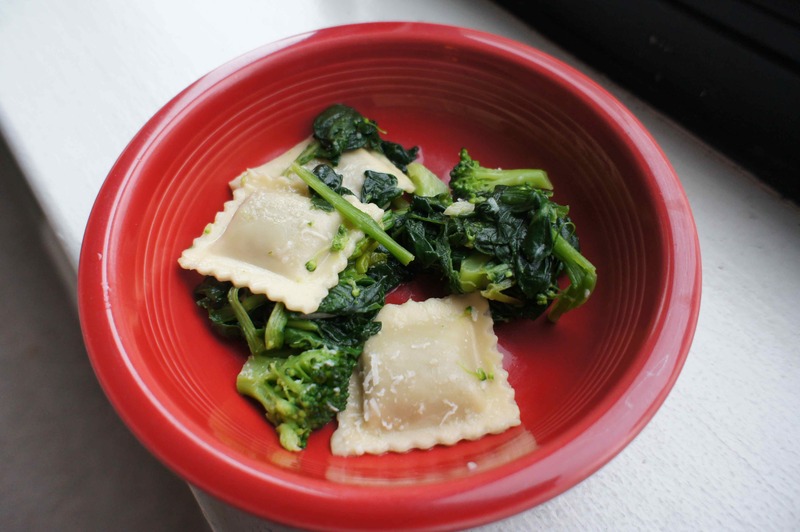 The four cheese ravioli from Raffetto’s tastes absolutely wonderful with butter, garlic and sautéed spinach. Some parmesan grated on top is good too.